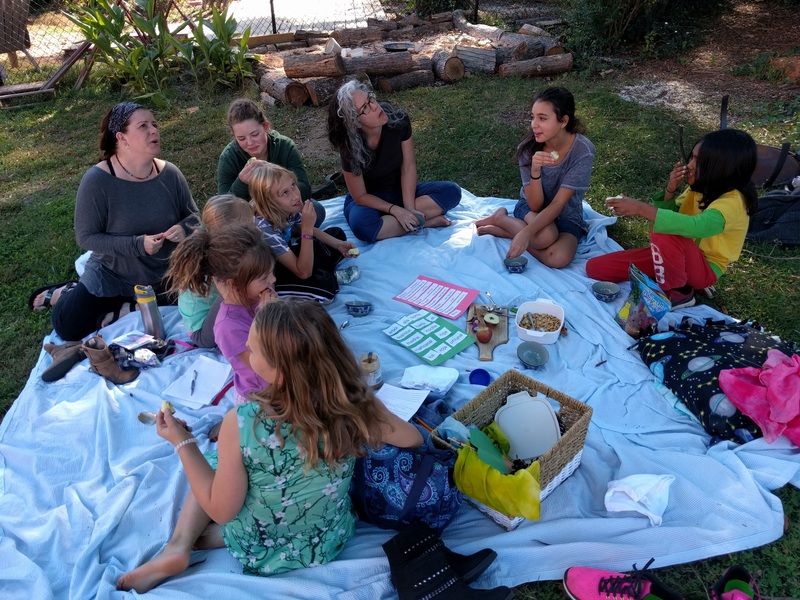 Two weeks ago, Vidya and I went to a “More than Mindfulness” conference at Rainbow Community School in Asheville. Each morning, the kids there start their day with a centering activity, and we got to watch what those were like. The teacher leads an exploration, story, or activity to start the day. We were really thankful that we were able to observe the teachers and kids in the classroom, and watched some neat activities we wanted to offer to our kids at Mosaic. 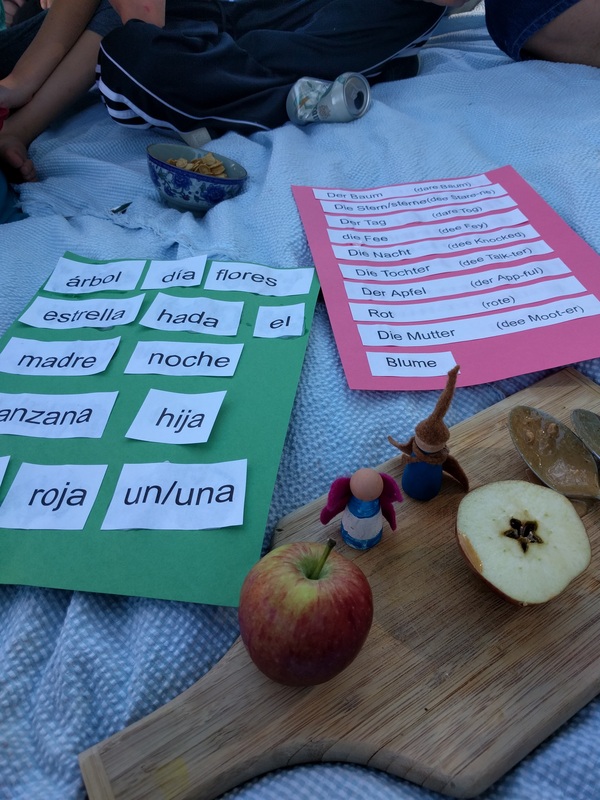 I learned about a Waldorf-inspired story about how apples got their stars and decided to offer it to the kids learning Spanish and German at school so they could learn some new vocabulary, hear the story, and eat a snack together. Once upon a time, there was un árbol/baum growing in a field. El árbol/baum was a happy arbol/baum most of the time. Each día/tag it enjoyed feeling the warm sun’s rays upon its branches. It loved the gentle breezes that tickled its leaves. However, as the sun set each día/tag and los estrellas/sterne came out in the sky, the arbol/baum felt a deep longing. It tried every noche/nocht to stretch taller and taller and taller. It wanted one of the beautiful twinkling estrellas/sterne for itself. After many weeks of this, one noche/nocht, as the arbol/baum was stretching itself upwards, a had/fee a flew from around the hill to ask el árbol/baum what it was doing. Many días/tag passed. Then weeks. Buds grew on el árbol/baum and then flores/blume grew from the buds. Eventually, green manzanas/apfel formed on el arbol/baum. El árbol/baum grew excited waiting for them to turn roja/rot so it could receive its estrella/stern from the hada/fee. Finally los manzanas/apfeln turned roja/rotes. El árbol/baum waited patiently día/tag after día/tag and noche/nocht after noche/nocht. The hada/fee did not return. El árbol/baum became sadder and sadder. Then one day un madre/mutter and her hija/tochter came walking along the field. “I’m so hungry!” The hija/tochter said to her madre/mutter. “I’m sorry, hija/tochter. I don’t have any food.” Her madre/mutter replied. El árbol/baum heard this and stretched one of its branches down to the hija/tochter, giving her one of its shiny manzanas rojas/rote apfeln. “Gracias, árbol/baum!” said the hija/tochter, showing the manzana/apfel to her madre/mutter. The madre/mutter cut the manzana/apfel in half and handed one to her hija/tochter. El árbol/baum looked down at the manzana/apfel and realized that its wish had been granted after all! 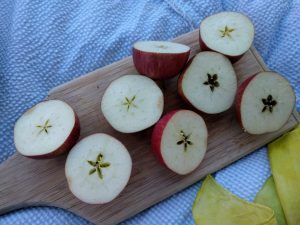 Inside each of its manzanas rojas/rote apfeln was a tiny estrella/stern. I don’t really know German, so it was challenging to figure this part out! Thankfully I had help from another adult who helped me with this part. After the story I held up the tree, fairy, mother, daughter, the backdrop for the day, night, star, and pointed to the color red. The kids called out what the word for those items were in Spanish or German, depending on which language they have been practicing. I also told them how in Spanish they would say “manzana roja” or “apple red,” reversing the noun/verb order we use in English. German does not do this. Then we all enjoyed a snack of apples and roasted pumpkin seeds together!